Op den Graeff, Graeff, Gräff in Germany - Familienverband Gräff - Graeff, Historie-Gegenwart-Zukunft e. V.
Originally descendant from Wolfgang von Graben) 1465-1521) who arrived to Holland in 1483. His younger son Abraham op den Graeff (1485/1490-1561 died in Düsseldorf), who possible married to Matriarch van de Aldekerk (1500-1525), was the alleged ancrestor of the Op den Graeff line in Kleve (Germany), while his elder brother Pieter Graeff (born 1484) was the ancrestor of the dutch (De) Graeff family. During the Thirty Years War, many genealogical records housed in churches were destroyed, and attempts to reconstruct op den Graeffs genealogy were made in the late 1600s in Germany. One reconstruct, entitled "The Works of Gabriel Bucellini" (Gabriel Bincelint) and printed in 1652 or 1662, had favourite Herman op den Graeff (1585-1642) descending like the dutch (De) Graeffs in the (maternal, Anna op den Graeff van de Aldekerk) line from the House von Graben through Wolfgang von Graben. The op den Graeffs where Mennonits and an immigrate to Krefeld. In 1683 some of the Op den Graeffs descendents migrated to the United States. Abraham op den Graeff, one of the three sons of Isaac Hermansz op den Graeff was invited by his cousin William Penn in 1681 to leave Krefeld for Philadelphia. They are among the thirteen families ("Original 13") often referred to as the Germantown, Philadelphia, Pennsylvania founders, who arrived on the ship Concord on October 6, 1683. Surnames were changed to Updengraff at some point either upon their arrival to Philadelphia or shortly thereafter. 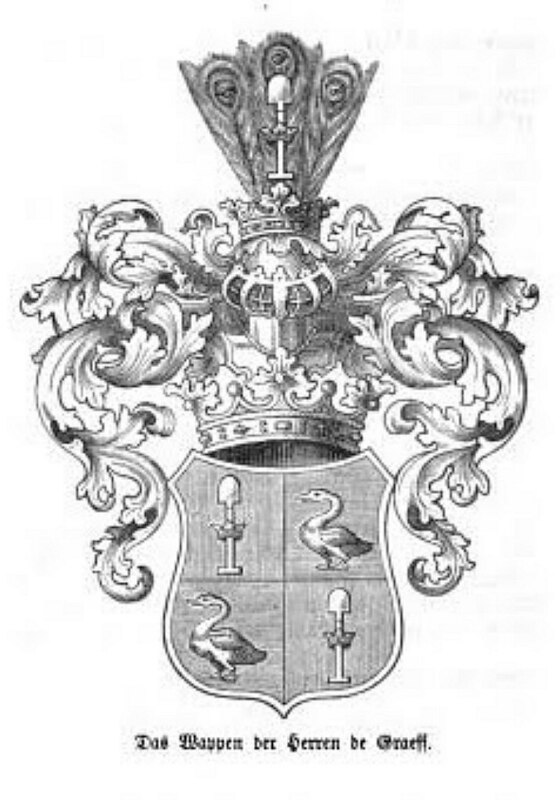 Another american Op den Graeff family, Updegrove, descendat from one John William op den Graeff (1732-1800/1804). They arrived to Germantwn around 1754.